Automatically handles unsubscribes and system bounces. Send immediately or schedule a future date. Manage Content by inserting or editing text, photos, documents, etc. Create online forms to collect various information. 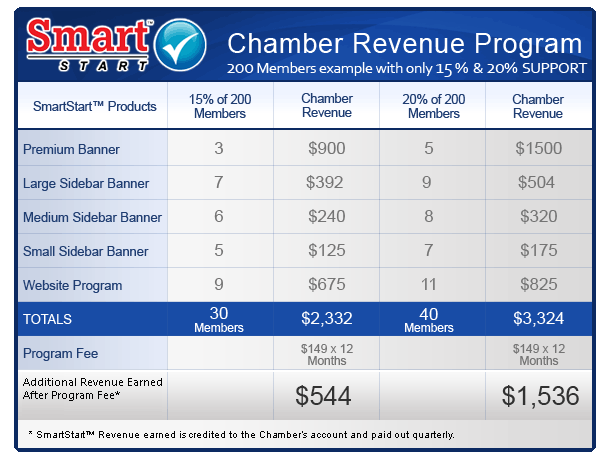 One of the many advantages of joining Sygnifi Networks' eCommerceConnect™ is the SmartStart™ marketing program, which enables your Chamber to generate non-dues revenues through the sale of SmartStart™ websites, e-Commerce websites, banners, search engine optimization and advertizing programs, Web TV videos and online reservation booking systems to your members.